It looks like Clear Channel Radio is pulling out all the stops to not see this replacement event take place later this summer. It's kind of ironic, 30 years ago WDAS was not allowed to hold "Unity Day" on city property. "The Unity Day on the Parkway" group seems to have done a lot of work within last week including getting their website up and running. The group may need to hearken back to Unity Day's history of 30 years ago. The City of Philadelphia did not grant a permit then because of the bitter relationship the administration had with WDAS radio. The first Unity Day was held in various non-city parks around West Philadelphia. ...and eventually grew to an event that estimates claim was attended by well over 100,000 people each year. Clear Channel cancelled this year's Unity Day Event due to budget reasons. Last year the event moved off the parkway and became a two day concert at a waterfront venue featuring various gospel, R&B and old skool Hip Hop groups. 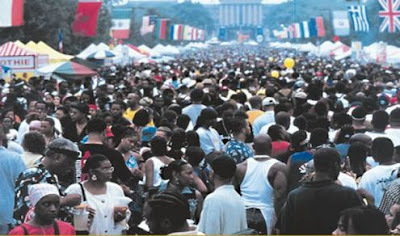 - Clear Channel’s WDAS 105.3 FM radio station contacted the City of Philadelphia and claims Trademark rights to “Unity Day” after a local Philadelphia group: Unity Day on the Parkway, Incorporated - files for a Special Event permit to host: “Unity Day on the Parkway” for August 23, 2009. The “Unity Day on the Parkway” event was Titled after the name of the Corporation. However, City officials refuse to budge on the organizations permit application. A representative from Unity Day on the Parkway, Inc. - Mr. Kyle Davis, Project Manager, states that once clear channel cancelled the event for 2009, it was our responsibility to protect a (30) year heritage that been adopted by the Communities of Philadelphia as their own. A lawsuit is forthcoming against Clear Channel, and it is unacceptable for Big Business to bully the Little People, when clearly, the Law is on Our side. We are asking Philadelphia to Support “Unity Day on the Parkway” for an August 23, 2009 event, by contacting Local Officials, City Council, Fairmount Park Commission and anyone else that the public can think of to support “Unity Day on the Parkway” by Telephone calls, Faxes and emails. Their website has an interesting presentation with plenty of ad space to fill with some information, although at this point I'm not sure what would be the motivation for people to attend this event without the opportunity to interact with WDAS radio personalities and to see performances from a variery of musical artists, none of which have been confirmed, and no real theme for the event. i would like toknow what ever happen to the real music that this sation use to play and not this so called hip slop or crap--oh rapp music.